I am very happy to be taking Paint Provence to Lake Powell. It is an area of great beauty and a wonderful watercolour workshop destination. Lake Powell is a reservoir on the Colorado River, straddling the border between Utah and Arizona, United States. 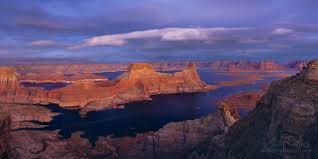 Most of Lake Powell, along with Rainbow Bridge National Monument, is located in Utah. It is a major vacation spot that around two million people visit every year. 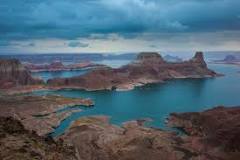 It is the second largest man-made reservoir by maximum water capacity in the United States behind Lake Mead, However, due to high water withdrawals for human and agricultural consumption, and because of subsequent droughts in the area, Lake Powell is currently larger than Lake Mead. The nearest local airport is Page Municipal Airport and the closest International Airports are Phoenix Arizona and Las Vegas which are both five hours drive away. The best thing will be to get a connecting flight from either of these airports to Page Municipal Airport where I shall come to greet you. Arrival in Page Airport. 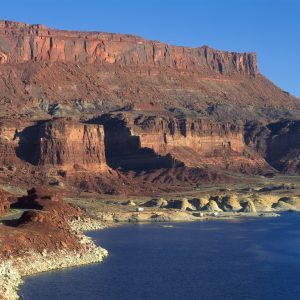 I have rented a large house in Lake Powell so I will be able to come and pick you up any time after 1 pm. Saturday is the usual settle in and talk about our week over dinner day. We have a garden that looks out into the dessert and we can even hike from there. I will teach basic watercolour techniques and of course tips on mixing colour for our local environment and how to draw and paint rock formations, water reflections and the immensity of the scenery that will be surrounding us. Antelope Canyon is only 14 minutes drive from our house, so why not spend our first day there. Walking, sketching and painting. Discovering, there is so much to take in here we might re visit. Possible Rainbow Bridge one of the worlds largest natural bridges. A sight to see they say. This would be an optional extra, as the only way to get there is by boat. This is a full day trip that includes lunch amazing scenery but would cost about $150 per person. We can discuss this trip when you get here. We would sketch and paint on the boat and I will teach you how to do 1 minute water colour sketches! Take photographs and then…. 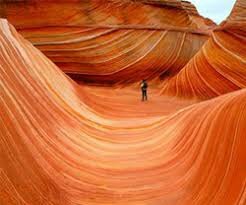 If we don’t do this trip there is also a wonderful boat trip to Antelope Canyon. Will be a home day, where we will turn some of our sketches and drawings into paintings with a possible visit in the evening to a Navajo Village Heritage Center. A day of lake side painting taking our picnic with us. With a possibility of visiting Horse Shoe Bend. Who wouldn’t want to spend the day painting here! 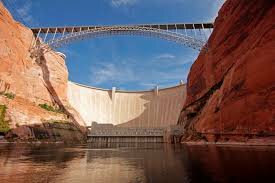 In the morning we may visit Glen Canyon Dam, on reading a lot about it. This dam has caused more harm than help but it is extra-ordinary to behold never the less and might interest you in in painting and drawing something quite phenomenal. Our Friday afternoons are usually taken up with finishing off paintings, maybe creating some new ones and discussing our work with a glass of bubbly and a delicious Friday farewell dinner. I take you back to the airport.